I'm the type of person who needs to get a little spendy with things in order to take care of them. When I wore Target sunglasses I would lose track of or just plain destroy a few pairs per year. After figuring out that spending $20 on 3 or 4 pairs per year evened out to 2 years of wear for a pair of Ray-Bans, it was worth it the splurge for me. 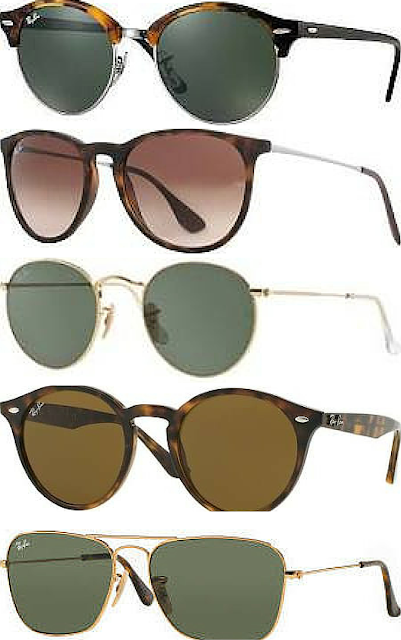 Slipping on sunglasses is one of the easiest ways to accessorize in the summer. Shopping for the right pair isn't quite as easy. I haven't been successful at buying a single pair of sunglasses online. Every single time I try on the pair I've fallen in love with... they never seem to look as great on me. I've put together this little guide so that you can benefit from my mistakes. Why is the Clubround good for heart and oval shaped faces? This pair is narrow measuring 51cm across. That means that round and squared faces that have a more consistent width top to bottom look a little squished in them. The narrowness of the Clubround exaggerates the narrowing of heart and oval faces to the chin in a really pretty way. The Erika is slightly wider than the Clubround and is a very wearable shape. The lenses taper just slightly to create a slimming effect on square and round faces. The rounded metal frames are kind of hard to pull off, that hardest to pull off on this list in my opinion. They are narrow and the rounded lenses exaggerate any roundedness in the face. If you have a round face and want to get in on the rounded lens trend, these are for you. These are just the right width and taper slightly as they round at the bottom for a slimming look. The Caravans are part of the "Icons" collection for a reason. These sunglasses are the easiest to pull off of all shapes. They're not too wide or too narrow, they're not too squared or too round, they taper just right and are perfectly unisex. My boyfriend and I have completely different shaped faces fight over who gets to wear these constantly.